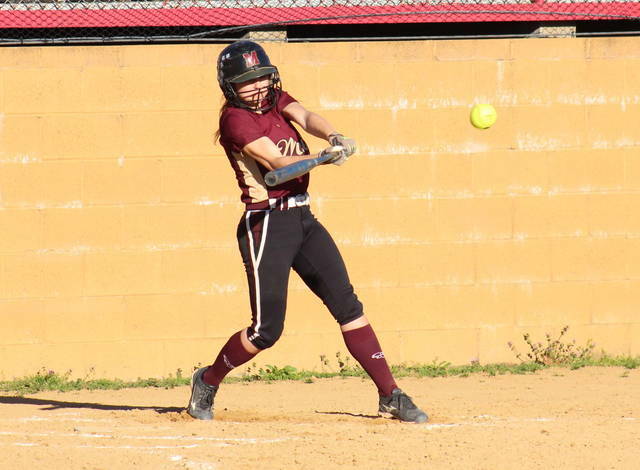 PPHS freshman Lilly Hill doubles in the first inning of the Lady Knights’ 9-1 win over Meigs on Tuesday in Point Pleasant, W.Va.
POINT PLEASANT, W.Va. — The start was the difference. 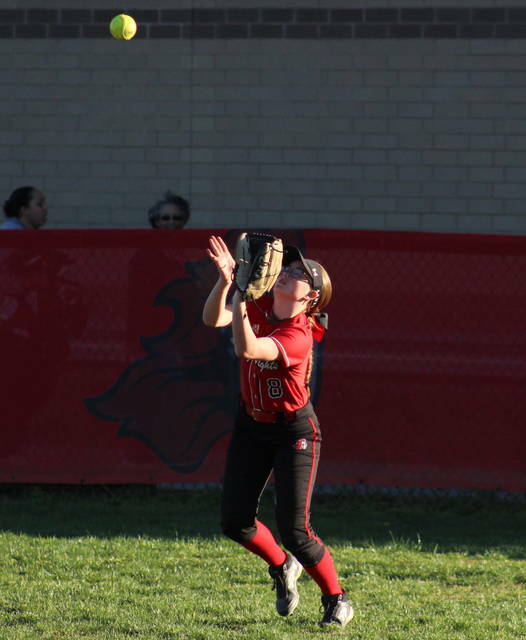 The Point Pleasant softball team jumped out to a 7-0 lead after one inning of play on Tuesday in Mason County, and the Lady Knights cruised to a 9-1 mercy rule victory over visiting Meigs. The Lady Knights (11-2) — who retired the Lady Marauders (6-6) in order in the top of the first — went ahead 2-0 after back-to-back bases loaded walks with no outs in opening frame. With one out in the inning, Lilly Hill hit a two-run double, extending the Lady Knight lead to 4-0. Following the second out, Hayley Keefer hit an RBI single and Peyton Jordan hit a two-run triple, capping off the seven-run frame. Meigs got one run back in the top of the second on a two-out double by Breanna Lilly, but Point Pleasant went up 8-1 on a Julia Parsons sac-fly in the bottom half of the inning. The Lady Marauders stranded two runners in scoring position in the top of the third, and then PPHS went ahead 9-1 on a two-out Emma Harbour single in the home third. 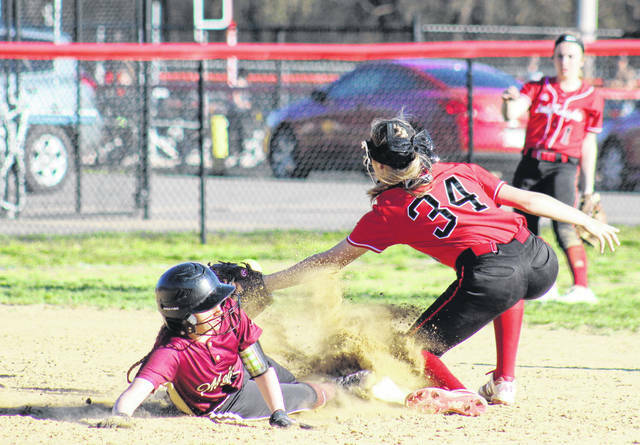 Meigs had a runner thrown out at the plate in the top of the fourth and didn’t reach scoring position again, falling by a 9-1 count in five innings. Rylee Cochran was the wining pitcher of record in a complete game for PPHS, striking out seven batters and walking two, while allowing one earned run on three hits. Hailey Roberts took the pitching loss for Meigs, allowing five earned runs on one hit and a trio of walks, without recording an out. Alyssa Smith finished the game for the guests, allowing four runs, three earned, on seven hits and two walks, while striking out four. 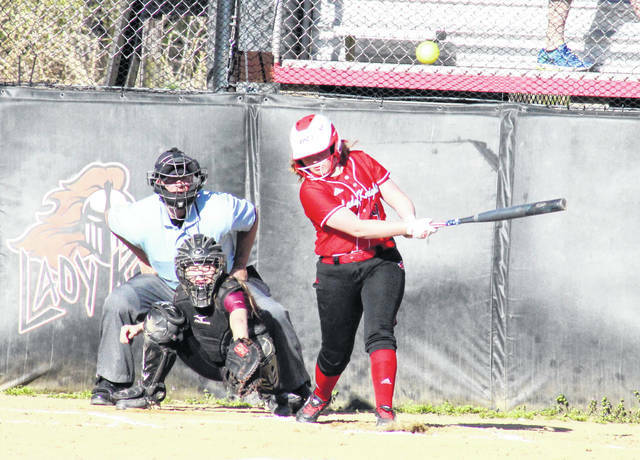 Leading Point Pleasant at the plate, Jordan was 2-for-4 with a triple, a double, two runs scored and two runs batted in, and Harbour was 2-for-2 with a double, two runs and one RBI. Hill doubled once, scored once and drove in two runs in the win, while Cochran and Hayley Keefer both singled once, scored once and drove in one run. Parsons contributed a single and an RBI to the winning cause, Kit Stroud added a run and an RBI, while Tayah Fetty crossed home plate once. Lilly doubled once and drove in a run for the guests, Taylor Swartz and Breanna Zirkle both singled once, while Mara Hall scored a run. PPHS finished with one error and seven runners left on base, while MHS had two errors and four runners stranded. The Lady Knights will be back on the field at Ripley on Thursday. After hosting Nelsonville-York in Tri-Valley Conference Ohio Division play on Wednesday, Meigs will have another non-league game on Thursday, with Marietta visiting Rocksprings.